In From One Winning Career to the Next, author J. David Quilter expertly guides the security professional through the corporate landscape. Having transitioned into the private sector from a long career in public service with the DEA, Quilter offers valuable perspective on the differences in culture and priorities between the public and private sectors, and how those differences can affect efforts in organizational security. Readers will benefit from the author’s insights on researching and joining a new organization, exploring a business’ structure and culture, and getting to know the executives and leaders within a business. Chapters contain practical advice on specific challenges (crisis management, assaultive behavior, threats to corporate assets, etc. ), forming an effective team, and making a business case to gain executive support for a security agenda. 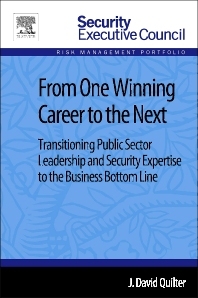 This book is vital background for security professionals considering career changes. It will also aid those in established positions in their efforts to communicate, strategize, and implement security programs and goals within a business. From One Winning Career to the Next is a part of Elsevier’s Security Executive Council Risk Management Portfolio, a collection of real world solutions and "how-to" guidelines that equip executives, practitioners, and educators with proven information for successful security and risk management programs. 5.11 Lesson #11: Choose to Sprint! David Quilter’s security leadership spans four decades with major contributions in both the public and private sectors. After a distinguished federal law enforcement career, David became director of security at four Fortune 500 companies. There he was able to transform asset protection programs in ways that delivered both better safety and security as well as increased profits. He has developed and integrated smart security programs in multi-billion dollar businesses engaged in energy infrastructure, as well as global manufacturing and distribution corporations. David’s cost-recovery tools have helped mitigate security risks while also improving profits. David both consults and is an active member of the Security Executive Council’s emeritus faculty. As an author and presenter David continues to work with individuals and businesses sharing his expertise with business and government leaders from around the world.